The idea that we are uniquely individual is accurate when it comes to our personalities, our aspirations, our contributions to the world, and to some extent our biology. But it is a big leap from noting that some people’s systems can better handle stress (unhealthy food is one form of stress) to stating that some people require entirely different categories of food than others. Human beings are one species; we are all the same animal, with the same digestive physiology. And, as is true of all species, we do not require personalized nutritional programs unless we are dealing with a specific disease or some other very unusual condition. Even then, our differences are a matter of degree, not direction. One person might be able to handle more fat in the diet without gaining weight or developing heart disease, particularly if they are highly active. Another person might need to follow Dr. Caldwell Esselstyn’s low-fat plant-based diet strictly to reverse their advanced-stage heart disease. But eating a high-fat diet, or a high-protein diet, carries no health advantage for any of us, when compared with the well-documented benefits of eating a variety of whole, plant-based foods, in sufficient quantity to meet our caloric needs. How Much Protein, Fat, and Carbs Do We Actually Need? The National Academy of Sciences has actually written a sourcebook for the nutrient requirements of humans and many other species,[i] including cattle, swine, poultry, fish, dogs, cats, nonhuman primates, and more. These requirements are based on observed symptoms of deficiency at lower levels of consumption. While protein and fat requirements vary a bit depending on gender and life stage (babies and young children need a bit more of each), the recommendations for adults do not vary anywhere near the extent to which we humans currently vary our diets. Where nutrition is concerned, it’s helpful to ask yourself, “Where in nature can I find an example of this?” And in this example of a very wide variation of nutrient intake, the answer is “nowhere.” In other words, you’ll be hard pressed to stumble upon horses that do better with some meat in their diet because of their blood type, or bears that need twice the protein intake of other bears. If they did, the ranchers and zookeepers would have quite a job on their hands, wouldn’t they? Somehow this logic evades us, when it comes to humans. Our species has specific nutritional requirements, and we can meet them by eating whole plant foods in sufficient quantity to maintain healthy body weight, just as other animals do, in their natural environments. [i] The National Academies Press. Accessed March 14, 2015. [ii] USDA Dietary Reference Intakes. Accessed March 14, 2015. [iii] A Week of Paleo Meals. Accessed March 14, 2015. [iv] Appleton BS, and Campbell TC. “Inhibition of aflatoxin-initiated preneoplastic liver lesions by low dietary protein.” Nutr. Cancer 3 (1982): 200–206. [v] Youngman LD, and Campbell TC. “High protein intake promotes the growth of preneoplastic foci in Fischer #344 rats: evidence that early remodeled foci retain the potential for future growth.” J. Nutr. 121 (1991): 1454–1461. [vi] Youngman LD, and Campbell TC. “Inhibition of aflatoxin B1-induced gamma-glutamyl transpeptidase positive (GGT+) hepatic preneoplastic foci and tumors by low protein diets: evidence that altered GGT+ foci indicate neoplastic potential.” Carcinogenesis 13 (1992):1607–1613. [vii] Levine ME et al. Low Protein Intake Is Associated with a Major Reduction in IGF-1, Cancer, and Overall Mortality in the 65 and Younger but Not Older Population. Cell Metab. 2014 Mar 4;19(3):407–17. [viii] Fung TT et al. Low-carbohydrate diets and all-cause and cause-specific mortality: two cohort studies. Ann Intern Med. 2010 Sep 7;153(5):289–98. 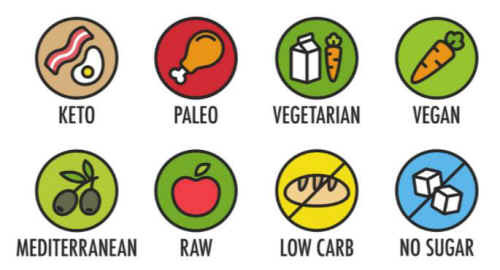 [ix] High-Protein, Low-Carb Diets Explained, accessed January 15, 2015. [x] High-Protein Diets, accessed January 15, 2015. To calculate these numbers, you have to look at the Recommended Dietary Allowance (RDA) for protein and the Adequate Intake, or “AI”, set for essential fats in the Dietary Reference Intake (DRI) tables for macronutrient composition (reference #10). These DRIs are developed by the Institute of Medicine, based on the available relevant evidence. The RDA is a specific recommended level of intake that should be adequate for 97.5% of a normally distributed population. The AI is what most people in the population eat on average and is used when there is not enough evidence to set an RDA. Using the average requirements as target intakes (a strategy even suggested in the DRI tables), a man weighing 175 pounds who eats a 2500-calorie diet would require 63.6g of protein and 18.6g of essential fats per day. The protein requirement is calculated by converting 175 pounds to 79.5 kilograms, and then multiplying 79.5 kilograms by 0.8 grams, the recommended daily protein intake based on body weight. The AI for essential fat is 18.6 grams for adult men. However, because whole plant foods naturally contain fat, if you eat a WFPB diet and don’t overdo the nuts and seeds, you’ll get more than the bare minimum of essential fats – around 40 grams is more likely. PROTEIN: 63.6 grams at 4 calories per gram = 254 calories from protein. FAT: 40.0 grams at 9 calories per gram = 360 calories from fat. 2,500 (total) – 254 (protein) – 360 (fat) = 1,886 calories from carbohydrate. In terms of percentage of calories, this comes out to approximately 10% protein, 14.5% fat, and 75.5% carbohydrate.